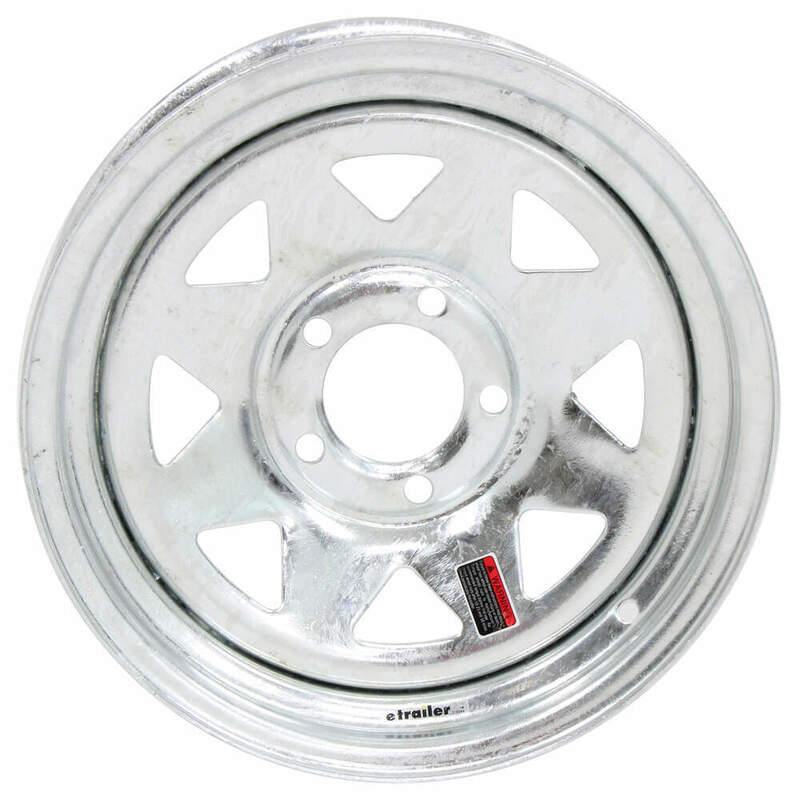 Corrosion-resistant, 15" steel wheel features a 5 on 4-1/2 bolt pattern and meets Department of Transportation standards. Lowest Prices for the best tires and wheels from Americana. 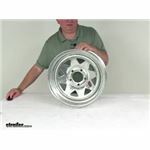 Steel Spoke Trailer Wheel - 15" x 6" Rim - 5 on 4-1/2 - Galvanized Finish part number AM20524 can be ordered online at etrailer.com or call 800-298-8924 for expert service. Corrosion-resistant, 15" steel wheel features a 5 on 4-1/2 bolt pattern and meets Department of Transportation standards. 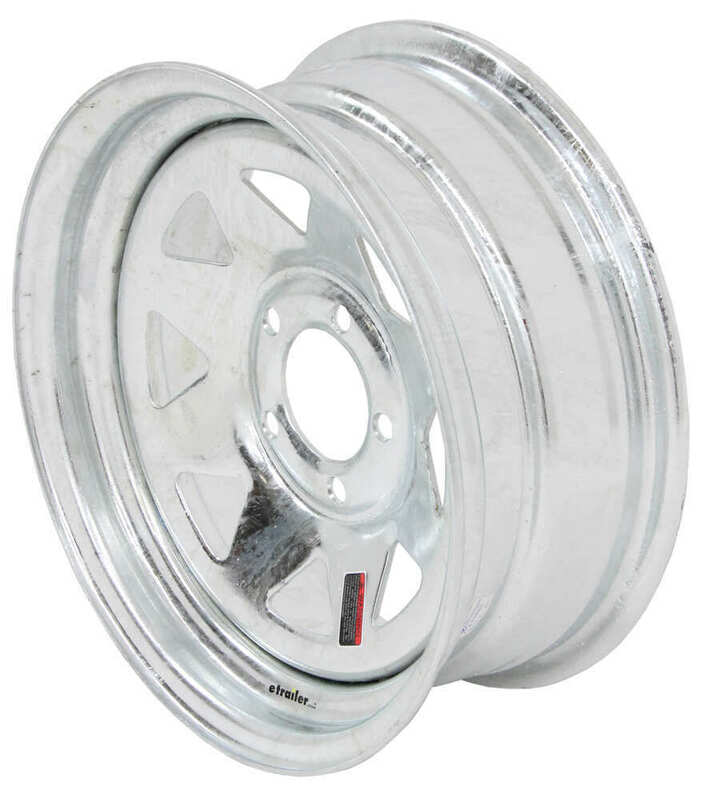 20524 8-Spoke Galvanized Wheel - 15"
This 15" x 5" steel trailer wheel has a 5 on 5 bolt pattern and a 3.19" pilot diameter. Improved torque retention keeps wheel secure when mounted on your axle. Rust-resistant, 3-step powder coat finish. Valve stem is included. Order: RelevanceNewestRating - High to LowRating - Low to High Corrosion-resistant, 15" steel wheel features a 5 on 4-1/2 bolt pattern and meets Department of Transportation standards. The center caps do not come with this wheel you will need a center cap with a 3.19 pilot diameter. I recommend part 319EZ. Tires that are 205/75-15 will fit on rims that are 5, 5-1/2, 6, or 6-1/2 inches wide. So either will work for you. 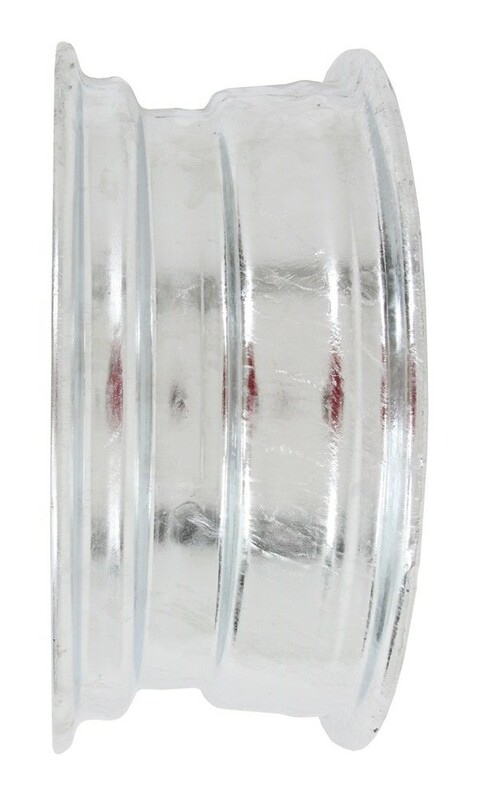 Like the # AM20524 is a galvanized, 5 on 4-1/2 steel spoke wheel that is 15 by 6 inches and will work with your tires. As you mentioned, we don't offer the # AM10245 205/75R-15 load range tire mounted on a rim because we don't have tire mounting equipment here, but you could purchase the rim separately and have a local tire shop mount them for you. We offer a 15x6 galvanized rim with a 5 on 4-1/2 inch bolt pattern, part # AM20524 that would work great with the # AM10245 tire. We don't have any wheel and tire combos that are exactly what you'd need so you'd need to use the wheel part # AM20524 which is a 15 inch galvanized wheel and then have the # TR20515D mounted locally so that you get the size, Load Range, and wheel construction you need. This tire also has a speed rating of 81 mph which is nice since most are only rated for 65. According to Dexstar, the Steel Spoke Trailer Wheel, # AM20524, has a capacity of 2,050 pounds at 75 psi. 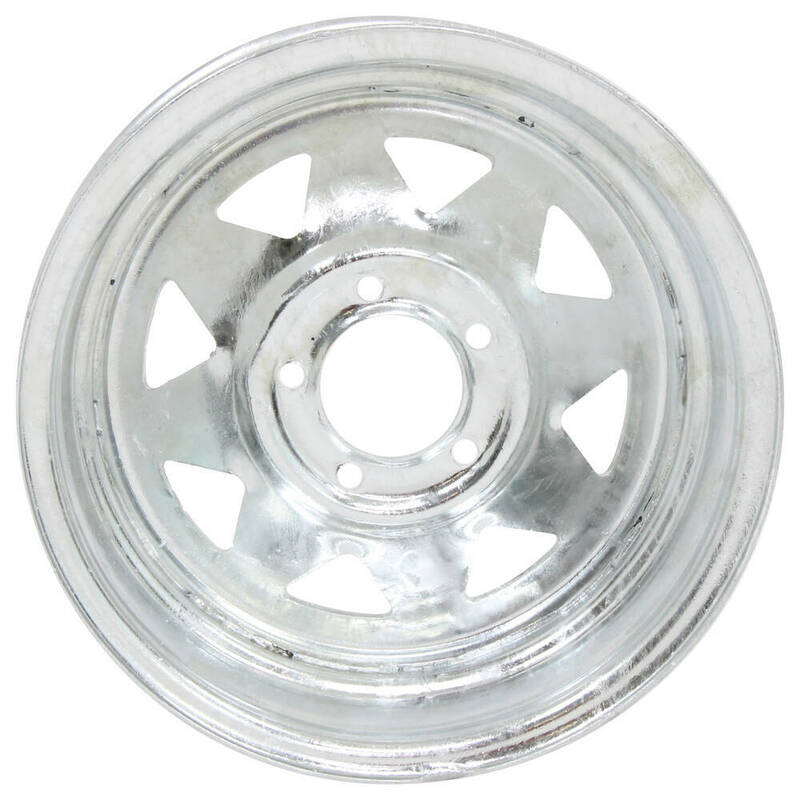 This is a 15 inch by 6 inch galvanized trailer wheel with a 5 on 4-1/2 bolt pattern. I have included a link to an FAQ article that explains how to determine bolt pattern for reference.